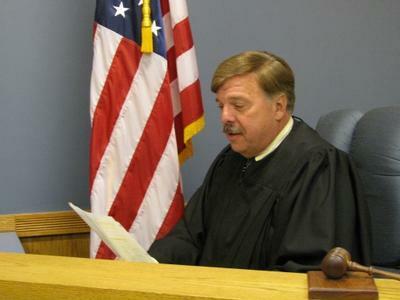 The Michigan ACLU took up Anderson’s case, calling it an example of unconstitutional “pay or stay” sentencing practices that continue in some courts. The U.S. Supreme Court has ruled that judges can’t jail people over debts without holding an “ability-to-pay” hearing first. And an expert panel convened by Michigan’s State Court Administrative Office issued a report in April, reaffirming that people who are unable to pay court fines or costs can’t be jailed. “Unfortunately, some judges are still unconstitutionally jailing people simply because they’re poor,” says ACLU attorney Miriam Aukerman. The ACLU filed a complaint with the Macomb Circuit Court earlier this month on behalf of Anderson and two other people facing “pay or stay” charges in Gerds’ court. Since Anderson was due to be sentenced this week, the circuit court stepped in to issue a kind of time out until it can decide the larger issue, Aukerman says. Gerds could not immediately be reached for comment at 38th District Court Wednesday. The American Civil Liberties Union is challenging the sentences of five Michigan residents who were jailed because they could not pay their court fines. Michael Steinberg of the ACLU of Michigan says judges are supposed to hold a hearing to prove whether an individual is too poor to pay a fine. Steinberg says in the five misdemeanor cases they’re challenging, those hearings didn’t happen and the people were locked up. They’re called “pay or stay” cases. Debtors' prisons were abolished long ago, but the ACLU of Michigan says some district judges in Michigan never got the memo. ACLU attorney Sofia Nelson says a recent case shows just how wrong things can go for people who can't afford to pay their fines. In September, Nelson says a Port Huron woman fled to her local emergency room after her boyfriend threatened her with a gun.